A teenager contends with domestic strife while falling for a new classmate. Remember when the teen film was all John Hughes gloss and big hair? Adventures in not only babysitting, but also dating, the prom and whatever Phys-Ed was? The teen movie consisted of lustrous narratives which provided sincere escapism and, in an essential aspect of their appeal, aspirational situations which thrilled their target audience, who, in turn, took these flicks to heart, wearing their VHS copies down in repeated cult viewings (come on, presumptuous little git he may have turned out to be in hindsight, but who didn’t want to be Ferris Bueller? For my part, I’d still set up in Santa Carla, Vampire Capital of the World, with its all-night sax on the beach parties, in a heartbeat). The millennial teen drama, however, is a different proposition altogether. Perhaps in consonance with the solipsistic nature of the social mediums which ver yoof use in order to negotiate the world - Instagram, Snapchat, WhatsApp, applications that necessitate a self-mediated reflection of the self - the teen film has become increasingly introverted, with nary a vampire in sight. Instead, there are the clinical depressives and suicide kids of The Perks of Being a Wallflower, and the doomed beauties of The Fault in Our Stars; oh-so-serious death fetish flicks in which the teen experience is characterised by mortality and lethal misfortune, executed with a fatalistic intensity that even the likes Jason Vorhees, stalking teenagers of their innocence all those years ago, may have balked at. With its self-consciously unassuming opening credits composed of cute, pencilled sans serif fonts and tinkling pianos, Centre of My World would seem to be within the same remit. And, sure enough, here comes the voiceover (the defining trope of the contemporary teen drama, with all its latent narcissism) to introduce our lead character Phil (Louis Hofmann), a sweet and pretty teen who is a ‘little bit gay’ and returning home to his unusually bohemian domestic set up following a stint at summer camp. Phil lives with his twin sister (shy emo Dianne) and his single parent mother, Glass (a free spirit, who is, of course, ultimately a bit broken). Even though Phil has only been away from Visible (this is what they, annoyingly, call the ramshackle mansion where Phil and co live) for a few weeks, things have mysteriously changed. A storm -METAPHOR ALERT! - has battered the surrounding area, and Dianne and Glass seem to be at odds. Not that Phil is all that arsed though. He’s out to have a laugh with his neon haired BFF Kat and has his eye on the cute new kid in class, Nicholas. The scene is set: following a series of romantic ups and downs, will Phil manage to get off with this handsome newbie? Well, ja is the answer. Almost immediately, Phil and Nicholas are together and having the best summer holiday evah; dressing up/down, spending their days skinny dipping with Kat, and their evenings shagging in an ornate lake house conveniently loaned to them by an understanding older lesbian couple. If it sounds ideal then that’s because it probably is; for most of its running time, apart from a de riguer wobble about his absent dad, Phil experiences precious little conflict and instead coasts through the sort of high jinks most teenagers would give their surging hormones and acne medicine for. While it may well be nice to see kids enjoying themselves and their youth, rather than those misery-guts wallowing in it over on Netflix in 13 Reasons Why, it isn’t really all that interesting, and, for the most part, Centre of My World (as the self-absorbed title would imply) is like force-watching the Instagram feed of people who are much younger, better looking and more fortunate than you: an exhausting, highly glamourised representation of what is essentially a typical adolescent experience (hanging out, falling in love) writ gorgeous, as if this soft focus, candy coloured depiction of teen wish-fulfilment is in itself entertainment enough. 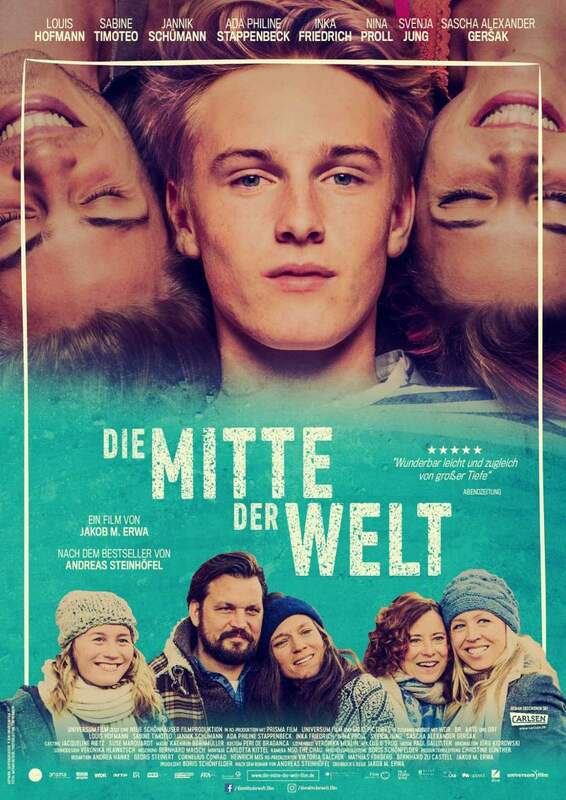 Like The Perks of Being a Wallflower and The Fault in Our Stars before it, Centre of My World is based on a book, the YA novel The Center of the World by Andreas Steinhofel (note the telling lack of personal pronoun in the title), which middle aged writer/director Jakob M. Erwa sought out the rights for. I haven’t read the source material, but I would bet that within the novel, the film’s subplot involving Phil’s sister Dianne would be foregrounded, as this thread has actual narrative potential, and is certainly more interesting than Phil, Kat and Nicholas’ sexcapades. Here there is actual darkness, and not the melodramatic catharsis of John Green, either. In Dianne, we see a teenager who is difficult, and who makes stupid, selfish choices dictated by her immaturity and own sense of importance (which is probably truer to teen experience than Phil’s #blessed day to day). Carrying a terrible truth, mistrustful of her own family, and accused of setting dogs on other kids, she is an obscure inversion of, and infinitely more intriguing than, her twin brother. It would be interesting to know how much of this aspect of the original plot was cut back in order to privilege the visual pleasures of Centre of My World. The film is beautifully shot, and edited with energetic imagination that extends to flashbacks, montage and cutaways. However, the cinematography mainly focusses on the nubile flesh of Phil and co up to their tricks, in a film ruthlessly calibrated towards teen vanity, framed within a fetishised adult view of the teen experience. By the time Centre of My World remembers to get around to its generic plot involving betrayals, secrets and, yes, death, you may well find you’ve outgrown it. 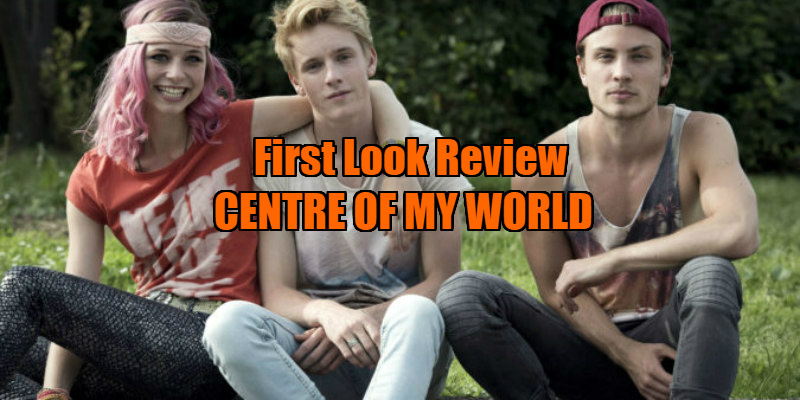 Centre of My World is in UK cinemas September 15th.